Good morning, I am here today to brief the public on the unacceptable rash of water main breaks that have occurred in Hoboken since June 23rd. In total we have experienced 14 water main breaks over a 64 day period, with two breaks occurring as recently as yesterday. Never before have we seen such a string of major breaks in our City; particularly during the summer months. In our view, there can only be one explanation: Suez has mismanaged our system. On June 23rd Suez commenced the installation of a new water meter and vault in the South West quadrant of Hoboken. This vault is the location through which the water we rely upon enters the City. And, we believe this project, which created unnecessary traffic jams due to improper planning, also undoubtedly stressed our water system beyond its breaking point. A conclusion representatives from Suez acknowledged yesterday, during our meeting, when they conceded that the new meter vault project could be a contributing factor to the spike in water main breaks. First, in order to expedite our ability to thoroughly investigate, and permanently resolve, the threat to the health, safety and welfare of our residents caused by these breaks, the City is declaring an emergency under Section 60-11 of the City Code. The declaration of an emergency will expedite the City’s ability to investigate and fix the cause of 14 water main breaks, in a two month span, in the middle of the summer. A message to the residents of Hoboken: this emergency does not in any way relate to whether the water is safe drink. It is safe. Rather, the disruption of service, risk to life and property from random and unpredictable water main breaks, and traffic nightmares are threatening the safety and undermining the welfare of everyone in Hoboken. We can not, and will not tolerate this any longer. Accordingly, we are compelled to declare an emergency in response to the severity of this situation and to support the aggressive response we intend to bring to its resolution. Second, the City intends to file a lawsuit against Suez if, as we suspect, our professionals confirm that the cause of the water main breaks is the result of Suez’s mismanagement of our water system. To this end, at the September 5th meeting of the City Council, I will be seeking authorization from the City Council to retain legal counsel to seek legal relief from Suez, if necessary, for the damages caused by their failure to adequately protect the system from water main breaks before, and during, the installation of the new meter vault. Third, the City Administration will be at the September 5th City Council meeting, seeking City Council approval to initiate the process of re-bidding the work currently being performed by Suez. 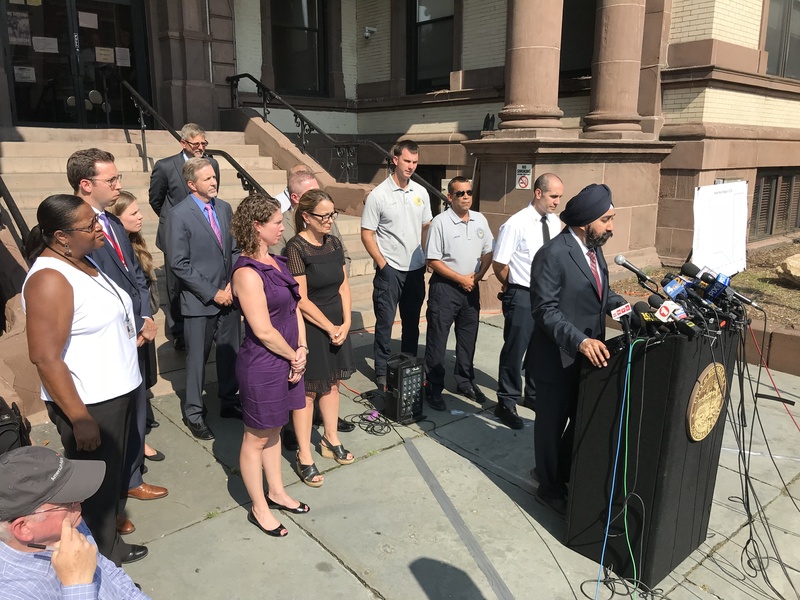 For several months the City Council, and my Administration, have been working towards a new Request for Proposals to be released in hopes of finding an agreement and framework that works for the residents of Hoboken, not the bottom line of a private company. Suez’s record speaks for itself and we no longer can work under an agreement that does not put Hoboken first. Accordingly, at the September 5th meeting, the process of replacing Suez with a new water system operator will be initiated. In conclusion, Hoboken’s aging infrastructure does not come as news to anyone. This is why we have been focused, for a number of years, on investing in the City’s water system. That includes over $7 million in the last 2 years towards replacing the water mains on Washington Street and approving $10.2 million in bonding for, among other things, the replacement of 2.5 miles of additional water mains. However, while that work is ongoing, an experienced operator, knowing the state of our system, must use care while undertaking improvements such as the water meter vault, so as not to over stress the system. Clearly, Suez, despite it depth of experience and intimate knowledge of our water system, did not do so in this instance. For this reason, the status quo is no longer acceptable to us and we intend to use every resource available to remedy these issues and find a new operator. I want to thank the City Council for their support and commitment to working with my administration to protect the City’s water infrastructure and, most importantly, the residents of the City of Hoboken. As we are all painfully aware, Hoboken has seen an extraordinary number of water main breaks over the past few years which have come to a head with three major incidents over the past week. As a governing body, we have been committed to allocating necessary resources to upgrade our water infrastructure, including approximately $5 million annually since 2016 targeted at high priority areas recommended by our water provider, Suez. Clearly this has not been enough, and we recognize that we need to do more. To that end, we are committed to working to resolve this important issue and look forward to working together with Mayor Bhalla and his administration to put in place a plan that will solve our chronic water infrastructure issues both in the near and long term. While we all may notbe able to be physically present for this morning’s press conference because ofwork and family obligations, we, as a City Council, speak with one voice withregard to this important matter. Mayor Ravi S. Bhalla with City Council members Emily Jabbour (in purple) and Tiffanie Fisher (in black) and members of his administration.